To carry out the work in the EA domain (Strategising and Roadmapping) effectively and efficiency, tools are mandatory. There are two fundamental domains (types) of information that any tool needs to be able to work with (Structural and Transformational) and this information is consumed and produced by various Disciplines. In general (because of their history and initial focus) tools operating primarily on Structural information have tended to be called EA Modelling tools and tools operating primarily on Transformational information have tended to be called EA Planning Tools. This is not a hard and fast rule though as many tools describe themselves using various adjectives - it’s not what they call themselves, it’s what information they manipulate. 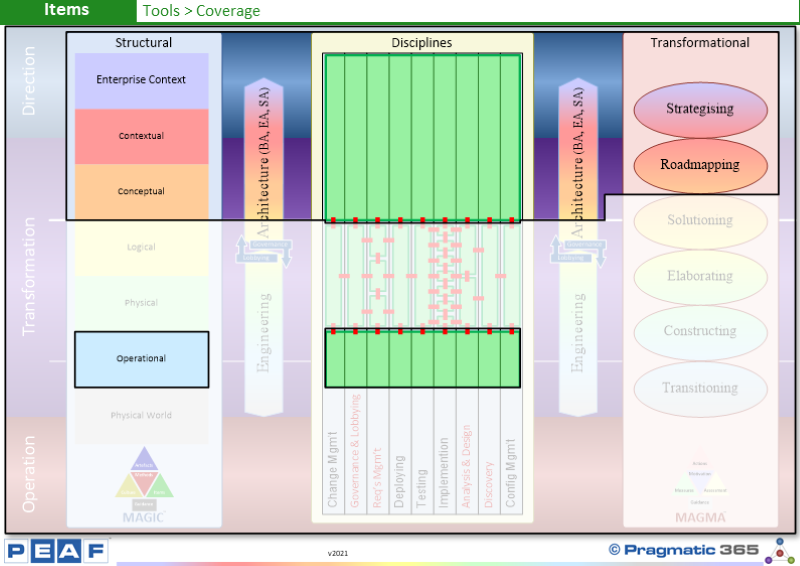 Which tools do you currently use for Enterprise Architecture? What domains (Structural/Transformational) do they cover? If not, does this present any issues or problems? What will you do to alleviate or solve them?